Sadly, the holidays are over and it's time to take down the tree and pack away our decorations for another year. It's a pleasurably melancholy process -- in essence, saying good-bye to old friends but knowing we'll see them again in another year. 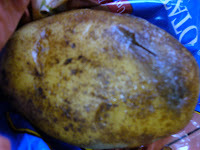 The russet potato that froze, thawed and refroze in the garage several times. 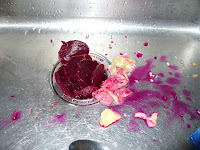 . . the last dollop of pickled beets and Danish cucumbers looking like a Jackson Pollock gone very, very wrong in the kitchen sink . 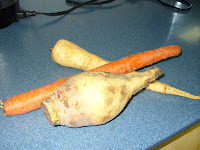 . . the root vegetables, so robust and turgid (look it up) a couple of weeks ago, now limp and wan . 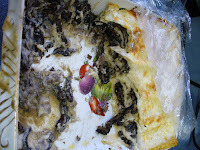 . . and that roasted portabella and prosciutto lasagna, creamily elegant on New Year's Day but now faintly threatening . Honestly. It really creeps me out. Still tastes good, though.